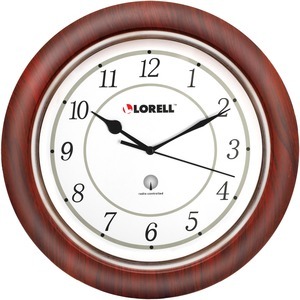 Round wall clock is radio-controlled so the setting is modified each day to that of the atomic clock, accurate to one second per million years. The clock automatically adjusts to Daylight Saving Time and designed to work in the continental United States. Design also features a wood tone frame, easy-to-read white dial, black Arabic numerals, black second hand sweep and ABS plastic cover. Clock runs on one AA battery (sold separately).